U.S. Senator Claire McCaskill, D-Missouri, says air ambulance expenses have skyrocketed in the last decade. She is proposing to allow states to better regulate medical costs associated with these services. 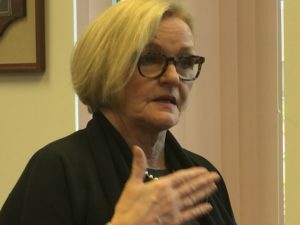 McCaskill requested documents from Missouri’s leading insurance providers and air ambulance companies after recent reports of families left with hefty medical bills when a family member suffers a traumatic injury. She says health insurance companies sometimes only cover a fraction of the costs in these instances. Carter Johnson, spokesperson for Save Our Air Medical Resources (SOAR) Campaign, tells Missourinet that McCaskill’s proposed legislation is well-intentioned but would have a devastating effect on Missourians’ access to emergency air ambulance services. She says air medical services operate in a regional capacity, covering multiple municipalities, and routinely crossing state lines to reduce out-of-hospital time and deliver patients safely and swiftly to definitive care. “This improves patient outcomes and reduces downstream healthcare costs for time-sensitive illnesses and injuries. Instead of allowing air medical providers to transport patients to the nearest, most-appropriate medical facility, as is the case today, this change would cause air medical providers to only look to in-state facilities, which could be farther away and less appropriate for the patient. In short, this seemingly small change could have a devastating effect on patients facing life-threatening emergencies, their access to care, and ultimately, their health outcomes. And it does nothing to address the issue of patient bills,” she says. Johnson goes on to say there is a better solution. “First, insurers need to do right by their patients and cover these life-saving services. They need to agree to a fair and reasonable reimbursement rate and drop demands for contract language that gives them power to overrule medical decisions by doctors and first-responders who deploy air ambulances,” she says. According to Johnson, 70% of air medical patients have Medicare, Medicaid or no insurance at all and Medicare reimbursement rates haven’t been updated in nearly 20 years. She wants Congress to enact House Resolution 3378 and Senate Resolution 2121, which she says would require providers to collect and submit cost data and bring Medicare reimbursements closer to the true cost of providing care. She says passing the legislation would take patients out of the middle and ensure access to such health care services.